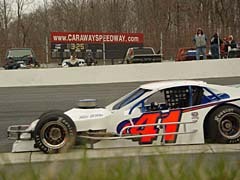 It was no surprise that Jay Foley, the 2001 Southern Modified Tour champ, was up front once again at Caraway Speedway. He led from the get-go on Saturday, but after winner Burt Myers got around him, his #57 machine began to fade. 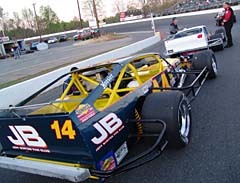 He held onto second, for the second race in a row, but not before a heated battle with Brian Crammer, who is making the haul from New Jersey to compete in all the NASCAR Whelen Southern Modified shows this year. Crammer had the faster car at that point in the race, but Foley kept the Jersey speedster in his rear-view mirror. But don’t think the thought didn’t cross the mind of the 20-year-old. 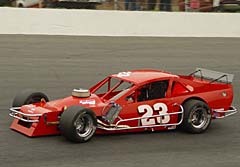 Crammer, who keeps his car in Jamie Tomaino’s (’89 Northern Modified Tour champ) shop, started fifth, fell back to as deep as eighth and then slowly picked them off throughout the race. “All those guys want to go all out the first couple laps so I just sat and rode for a while,” explained Crammer. “I let them pass me and they came right back to me. I think I was good enough for second, but that’s the way everything plays out. Brian Loftin has the talent and the best equipment money can buy. One thing he doesn’t have right now is luck. For the second-straight race, Loftin didn’t take the green with the rest of the field. In fact, it appeared that the same gremlins that bit his #23 machine last time did him in again this time. After losing many laps with his crew under the hood of the car, the team finally figured out their snafu. Loftin did get out on the track, and while he was more than 100-laps down, he did get some valuable track time and finished 17th. The only problem, it made him realize just how good his chances were if the problem didn’t occur. 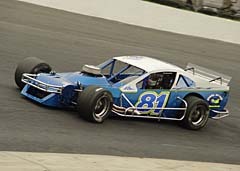 Longtime Southern Modified competitor made his return to the open-wheeled wars after missing the first race due to his beautiful #83 Mod not being ready. Brown didn’t have the 2005 debut he was hoping for. He qualified 10th, but almost immediately things went sour in the race. ARE BROWN, LOFTIN & HEDGECOCK OUT OF THE TITLE CHASE? Two races in and it appears as though a few favorites for the inaugural NASCAR Whelen Southern Modified Tour championship already have a tough row to hoe. 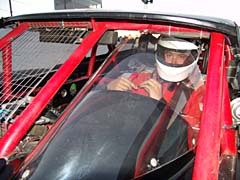 As we mentioned, Brown missed the first show; Jay Hedgecock had a mechanical bug bite him while running up front in both races and Loftin hasn’t even seen a green flag out his windshield yet. However, none of them are giving up the battle just yet. Young gun Brian Loftin sits even worse, 18th in the standings after two shows, but this is something he has become accustomed to. And then there’s Brown who, despite missing the first race, is actually higher in points than Loftin. Junior Miller knows a thing or two about running for a championship; he’s won seven of them. Race number two on the SMT was one he’d probably rather forget, despite the fact that he still finished sixth. “We went from 12th to fourth in like 12 laps so the car was pretty good early on,” explained the Advance Auto Parts driver. “Then I was just going to ride there and save my tires until the end because there was still a long way to go. But after like 40-laps the car just gave out. “We came in like three times, but it didn’t help. The car just went away and I think it was we had some bad tires. Northing really helped so I think we had two bad rear tires. Junior Miller has won 7-Southern Mod title but even he was puzzled Saturday night at Caraway. 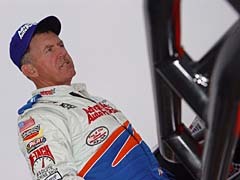 It’s been a while since Bobby Hutchens has run like he did the other night at Caraway. Then again, as he admitted to us after the first show, it had been nearly a year since he was on a track as big as the half-mile nestled in the Northern part of the hills in the North Carolina. Saturday night, Hutchens, who is among the top brass at Richard Childress Racing by day, finished fifth. “We had a little brake problem and I couldn’t keep the balance of the car like I wanted. We had a good run, a top-five, and I’m just about to get used to driving again. From that perspective we are pretty happy. We’re gaining on it. For Hutchens it was an especially good night due to the facts that his dad, who is battling cancer, was on hand and his #14 Modified also had a new sponsor. Michael Clifton, who owns a Plumbing company in North Carolina, says he’ll run the Tour as long as he’s got the money to do it. Well, so far, so good for the man who won the 2004 opener for the SMART series. “I think we had a whole lot better car than what I was showing,” said fourth-place finisher Clifton. “I just hate we didn’t finish any better. It seemed like I couldn’t get around anybody. Every time I tried to get up under them the back came out or if I went up high I would scoot up the track with as much speedy-dry that was up there. 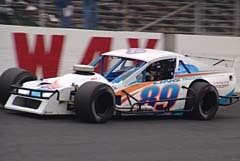 Early on it looked as though Frank Fleming may be standing tall in victory lane as the winner of only the second-ever Whelen Southern Modified Tour race. He was running second and pressuring Foley for the top-spot. But as they said on the movie Days of Thunder, “Tires, son, is what wins races,” and Fleming did have some tire trouble. Fleming lost a couple laps in the pits changing the tire, but still wound up ninth. When we first saw John Smith during the autograph session just prior to the race, you knew something was not right. He just looked a little pale and that southern smile wasn’t on his face. “I had the flu,” said Smith just before climbing in his Modified. As if having the flu wasn’t trouble enough, Smith’s normally fast #25 Modified was way off pace the entire distance of the event. “That was the sorriest car I’ve ever had here,” he admitted. “It was like someone turned the switch off; my car just went bad. We had a right-rear tire that was checking like 80 (on the durometer) and the rest of them were checking like 40 so it was an uphill battle all night long. 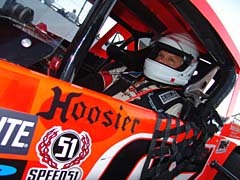 Smith, who works in the Wood Brothers Nextel Cup shop during the week, was fortunate to be able to race Saturday. Jason Myers told us after the first race that he shut off his #4 Mod as soon as the oil light came on. He said he just couldn’t risk hurting the engine. He didn’t have that same luxury this time around. Saturday night, things looked bleak for Jason. His brother was in victory lane, but he did not know if he would be racing the next week because that was his only engine. Fortunately, brother Burt’s car owner Phillip Smith is coming to the rescue. Those were the words of Alex Hoag, grandson of famous Mod racer Dutch, as he pondered how he would get to the next event after blowing his engine in race number-2. Hoag again was turning in an impressive performance. He finished sixth in the opener and looked to at least match that this time around. And while at first things appeared bleak for Hoag, 51 learned Wednesday that sometimes appearances can be deceiving. The father-and-son combination of Gene and Brian Pack have been around the southern Mod scene for sometime now, but neither can think of a more difficult time. Sure both of them have had their troubles in the past, but not at the same time. 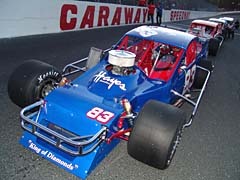 Brian was the first to have trouble this time at Caraway; the #81 had mechanical issues from the onset of the day. “It’s been a pretty rough three weeks,” claimed the younger Pack. “Two weeks ago, we blew a motor and clutch; this week, we changed everything we could so we don’t know what the deal is. Father Gene Pack scored his second straight 11th-place finish, but not without his share of difficulties. So what do the Packs need to do to improve their luck? Danny Wyatt was at the first show a couple weeks ago, but didn’t get to compete due to mechanical issues, but this time around he more than made up for it by capturing an eighth-place finish. 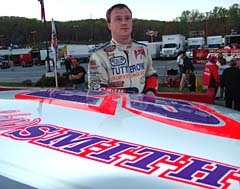 Corey Smith, on the other hand, went 40 laps in the first outing, but this time he went the entire distance for a tenth-place run. “Second night out was better than the first. We’re getting used to these cars. We’ll spend the next race here getting familiarized with things and then, during this long break, we’ll get a chance to test a little. Just trying to get the car dialed in as well as the driver,” said Smith, who was running in only his second-ever Modified race. 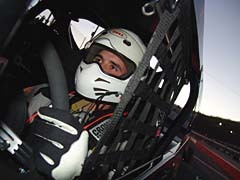 This Saturday night, Caraway Speedway will host race #3 on the NASCAR Whelen Southern Modified Tour. 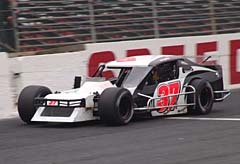 After this event, the series will take nearly a two-and-a-half month hiatus while the Modifieds begin their weekly series at Bowman Gray Stadium. However, the event at Ace Speedway (Altamahaw, NC) was washed out a couple weeks ago and so far there is no word on when that race will be rescheduled.